The only thing that I wanted from this week’s episode of The 100 was a Lexa-Clarke showdown. And though this episode was far from perfect — it’s plagued by confusing plot points, a clunky Abby-related misstep, and a gratuitous death — “Ye Who Enter Here” really delivers by exploring the many layers of Clarke and Lexa’s relationship. When the episode first opened with them together, though, I bit my lip in frustration. I wanted the characters to have a little space before their big confrontation. The writers seem to have anticipated this, and quickly let us know, through Lexa, that the meeting is taking place a week after their initial reunion. It’s those seven days that cause the majority of this episode’s pacing issues, but in the greater context of the Clarke/Lexa relationship, it’s the ideal amount of time. The dust has settled. Instead of hand-to-hand combat or an outright screaming match, Lexa and Clarke finally talk about what happened at Mount Weather. Lexa argues that Clarke would have made the same decision if she faced a choice to save her people. 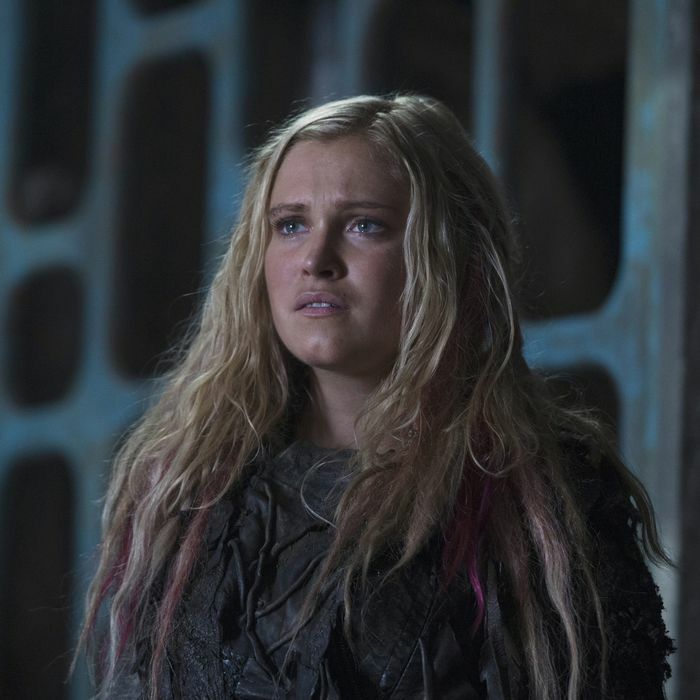 Clarke disagrees, but her face seems to tell a different story. Last season, when Lexa betrayed Clarke, the hurt and confusion that washed across Eliza Taylor’s face contributed to one of the most powerful performances I’d seen on The 100. After rewatching that scene, I’ve realized its emotional heft didn’t just come from Lexa’s betrayal. Clarke had allowed herself to feel something complicated and messy with Lexa; she had found a person who understood her and her power — and that same person betrayed her. Her isolation was compounded after Mount Weather, and it’s in this episode that her feelings come to a head. Clarke finally realizes that Lexa is the only person who understands her. Lexa sees Clarke in a way that she can’t see herself, except in her darkest moments. Lexa tells her as much, saying, “You can’t run away from who you are.” Rather than apologize, Lexa then jumps straight into Commander mode, offering a plan to keep both of their people safe. She wants the Sky People to become the 13th Clan, but Clarke shoots this idea down. If Lexa wants Clarke to make her look stronger, she’ll have to kill her. Taylor knocks it out of the park in this scene. Though the script itself could have gone haywire — it’s almost too on-the-nose — she holds her anger and betrayal right at the edge, never allowing her tone or acting to dip into petulance or whines. Alycia Debnam-Carey holds her own, too, and as a result, their confrontation feels emotionally grounded and real. Clarke doesn’t have to tell Lexa that she’s heartbroken; the sentiment is as clear as day in the scene’s subtext. Then, right before the opening credits, Lexa heads to her summit and listens to the Ice Nation delegate grill her about her plan. She humors him calmly, then kicks him out of the window. It’s an unexpected, totally badass move. “Ye Who Enter Here” doesn’t slow down after this, and I found myself wishing that the pace would ease up just a bit, if only to explore some of the episode’s heavier details. Abby and Kane visit Polis for the summit. Before they arrive, Kane gently chides Abby for her decision to let members of the Farm Station move in to Mount Weather. Last week’s episode clearly established that Mount Weather is a loaded symbol, filled with horror and death for the Grounders. It’s surprising that Abby would be stupid enough to ignore this — Lincoln and Octavia have explained its meaning to her. Using Mount Weather as a medical station is one thing, but allowing people to move in? I’m not sure Abby is that naïve. She also seems surprised when Kane suggests that her decision could have severe consequences. The whole sequence raises questions about where both of them were during the past week: Wasn’t Kane around to end this insane plan? Was Abby not listening? Both of them know that Lexa has Clarke, and the idea that Abby would risk her daughter’s safety is tough to swallow. There’s also some back and forth between Abby and Kane about who’s more suited to serve as chancellor. Though they both acknowledge that this transfer of power should be voted on, by the end of the episode, Kane’s belief in democracy is trumped by circumstance. Or so it seems: When a leader of the Sky People is asked to come forward during the summit, Abby encourages Kane to step forward. The debate over democracy isn’t explored, unfortunately — and neither is Abby’s realization that she’s struggling with the responsibilities of being a chancellor. This sidelines both Kane and Abby into minor roles, and snatches away a bit of their agency. Meanwhile, Prince Roan manages to sneak a knife into Clarke’s room and tells her that she can get close enough to use it on Lexa. It’s a testament to just how hurt and betrayed Clarke is that she actually tries, pressing the knife against Lexa’s throat. What’s unspoken between them says much more than any conversation could have. Lexa apologizes, and Clarke drops the knife. The sexual tension between the two ratchets up even higher. “I never meant to turn you into this,” Lexa says, and tells Clarke that she’s free to go. Instead of simply walking away, though, Clarke tells Lexa that she has another idea. Bellamy, Raven, Gina, and Octavia head to Mount Weather to help out with renovations. Bellamy is mad that he didn’t get to go along to the summit, and he believes he’s being punished for his rogue mission. It’s a good thing he’s not there, though — the girl he was imprisoned with at Mount Weather, Echo, arrives and tells him about the Ice Nation’s plan to attack during the summit. The whole thing seems rigged to me, but Bellamy does have a little bit of a savior complex, so goes after the assassin at Polis. At Mount Weather, Sinclair, Raven, and Gina try to formulate a backup plan in case there is an attack. Raven cockily mentions that she can figure out the missile launch codes. It’s a little too much irony for me to handle. Mount Weather already has a complicated legacy for the Grounders; thousands of people died there. The Sky People are attempting to revive it for humane uses, but the second the Ice Nation presents a threat, they revert to Mountain Men ways and start talking about missiles? Like Abby’s decision to move people back into Mount Weather, the plot point doesn’t track well for me. They aren’t really that stupid, are they? Of course, the entire thing is a setup. Bellamy and Octavia reach Polis just as Raven and Sinclair realize that the assassin is in Mount Weather … and has activated some sort of self-destruct sequence. As the summit looks on in confusion, Raven radios in, telling everyone that Mount Weather was blown up. Everyone there is dead. The Ice Nation takes responsibility for the attack, and Lexa announces that this is an act of war. She pledges to support the Sky People against Ice Nation. Clarke decides to stay, telling Abby she needs to be there to keep Lexa accountable. We find out that self-destruct codes came from the last surviving Mountain Man, who’s aligned himself with the Ice Nation — and we get a brief glimpse at the Ice Queen. Before the episode ends, there’s a final moving scene between Lexa and Clarke. Lexa’s advisers believe that adding the Sky People to the coalition is risky, and it’s hard not to view her plan as a way to repair her relationship with Clarke. When Lexa kneels before Clarke, swearing fealty to her and her people, I couldn’t help but think back to last season. Remember when Lexa told Clarke that, as Commander, she didn’t have the luxury of putting her emotions ahead of her people’s needs? That feels like an awful lot of foreshadowing now. Will Clarke be Lexa’s downfall? This week, The 100 omitted Jaha’s entire story line. It’s an interesting decision, and it makes me wonder why the quest for the City of Life has been getting so much airtime. John Murphy is one of my favorite characters, and I do want to see why he makes such terrible decisions, but after “Ye Who Enter Here,” I’m concerned. If his story isn’t quickly reintegrated into the show’s larger narrative, Jaha and Murphy will just be robbing chances for other characters to get onscreen. Three episodes into the season, and we’ve already lost someone: Bellamy’s girlfriend, Gina, who dies in a particularly grotesque attack. Since she’s a character who just recently showed up — and whose only personality traits were being cute and a little bit snarky — I’m particularly unmoved by this loss. I hate seeing a female character serve simply as a vessel for another character, but I suspect that she’ll serve the story better in death than she did while still alive. This is the second time this season that Bellamy’s instincts have led to serious consequences. Will he blame himself for his girlfriend’s death? Raven’s injury comes back into play in this episode, especially as she shows immense vulnerability while explaining her surgery fears. I really don’t want Raven to go down for the count — or end up worse off than before — but I sure want to see Lindsey Morgan shine in more scenes like these ones.